Poets, we want your writing about the internet! Overland is seeking poetry submissions for a special online edition – ‘Tribulations of the digital frontier’ – to be guest edited by long-time Overland volunteer, Mitchell Welch. Submissions close 11.59pm (AEST), Monday 10 September. The special issue will be available online in early November. Contributors for this edition will be paid $150 per poem. Friends, these digital days are trying times, indeed. The symptoms of Munchhausen-by-proxy-server are creeping further and further into our collective unconscious; anonymous identitarian rage collectives grow strong; cynicism and nihilism are opening shopfronts on High Street for the first time in a long time, and the immense, inevitable and ever-widening disconnect between the connected and not (which maybe ain’t so different from what we used to call ‘haves’ and ‘have-nots’) just keeps on widening. So what I’m hankering to know is this: has the great emancipatory promise of the internet been realised? Or have we collectively herded a veritable stampede of culture industry cattle – and make no mistake good people of the late Holocene (or, as it were, early Hologram-o-scene), it is an industry – into a deep theatre of dark metaphysics where not even the critics, let alone the audience participationists commenting from their stalls, have had a chance to get a measure of the hall? Has the human language, and have our long-abiding faculties for signaling and receiving data, adapted to the physics of frictionless exchange? And, importantly, is it still OK to be a Luddite? Yes gentlefolk, one and all, I suppose there is an irony in taking this discussion online, but irony’s damn near a linger franker out here on the boundless plains of the virtual prairie, and some of that old-fashioned poesy might just be the tonic we’ve been thirsting for. Submit your digital frustrations in the form of frontier pomes, ballades, lyricks, or com-po-sitions, up to three per contributor, online, or – for those folk without means of accessing Internet – by way of Pony Express. Mitchell Welch is a writer, communications advisor and would-be method editor from Melbourne. Kindly note: for this special edition, we’re accepting all poetic forms – poems, ballads, lyrics, compositions, rants, etc – but please no more than three submissions per poet. 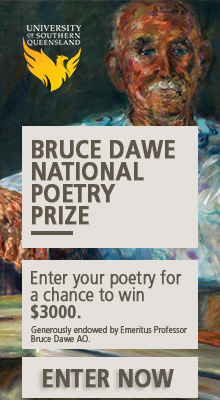 Click here to submit your poem. Not yet an Overland subscriber?